Voters on both sides of the Bay have a chance this November to support critical local and statewide measures to fight homelessness and protect renters. These grassroots initiatives are being massively outspent by corporate landlords and the real estate industry, so we’re going to have to depend on people power to get the word out. Can you support with doorknocking, phone banking, and passing out literature? These are the measures that are at stake. #YESon10 – Prop 10 – The Affordable Housing Act – is the BIGGEST statewide measure to protect tenants in decades. It will restore the rights of local communities to address the housing affordability crisis by repealing the Costa-Hawkins Rental Housing Act. Costa-Hawkins prevents cities and counties from applying rent control to apartments built after 1995 or to single-family rental units and condos. It also protects a landlord’s ability to raise the rent to market rate on a unit once a tenant moves or is forced out. 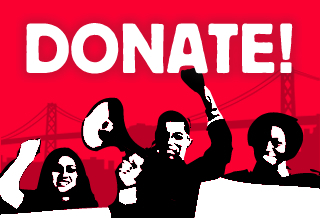 #YESonC – Our City Our Home – Is a bold plan to tax the richest corporations in SF to fund eviction defense, housing and services for our homeless neighbors. 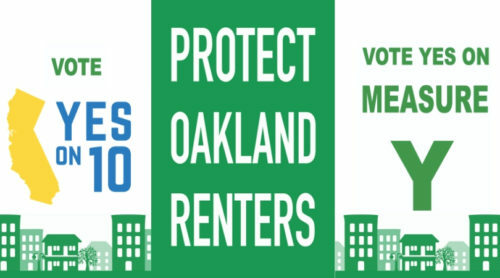 #YESonY – Measure Y expands eviction protections to all Oakland renters in homes built before 1996, regardless of the size of their building and if their landlord alleges that they live on the property. Measure Y will protect over 8,000 tenants in duplexes and triplexes by closing a Just Cause eviction protection “loophole” that is being abused by speculators and bad-acting landlords. Come help us call our Spanish speaking communities! Food, training, and phone provided! 100 Kansas Street between 16th and 17th for food, phones, friends and fun! Come by for an hour or stay the whole time — food, training, and phones will be provided! Date: Monday, Tuesday, Thursday Oct. 16-Nov. 1. Date: 11/3 10AM-2PM, 11/4 12-4pm, 11/6 12:30-4, 2-6, & 4-8.